Our story becomes more complicated now. One strand will follow the developing relationship between Ekaterine and Filonov and another will follow Anatoly. The strands will often intertwine as might be expected of any story involving a mother and her son. Ekaterine and Filonov seem to have developed a strong relationship, starting from her teaching him English. But also at one point hiding incriminating material for her. It seems that her apartment was to be searched for anything that the new regime considered dangerous. Esper had a lot of material from the pre revolution period which would have caused trouble under the new masters. Filonov hid the material for her. 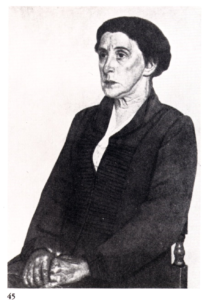 Ekaterine worked as a translator and English teacher, and she also participated in the Leningrad branch of the “All-Union Society of Political Prisoners and ex-exiles”. She also wrote her memoirs. Eventually in 1924 Ekaterine and Filonov married. It was a strange marriage, he was 40 she was 60. Apparently they continued to live in their own apartments, he would visit her every morning. Ekaterine had repeatedly refused to register the marriage and in her diary she comments that she “lived [with Esper] for 36 years without the rites!” This is interesting as it comes from Ekaterine’s own diaries which are in the Russian state museum archives in St Petersburg. But it may mean that Ekaterine and Esper were never formally married. It might explain why her name on Vladimir’s birth certificate is shown as Ekaterine Tetel’man, though the custom in Switzerland at the time may have been to show the mother’s maiden name alone, though this seems unlikely. The only indication of them being married is from a comment by Lev Tikomirov though he offers no evidence. Pavel Filonov was a strange and interesting character it is worth reading his Wikipedia entry to try to gain an understanding of him. He developed an innovative approach to paining, creating large canvases but using a very small brush. His approach was that a painting had to be “made” atom by atom, bit by bit, working from the small to the large. Some of his more startling works are canvases absolutely filled with many images often heads, often distorted and using sombre colours. But other paintings were more conventional in style, one especially of his sister looks almost photographic in its style. He also painted Ekaterine and Pytor. In 1925 Filonov started a school of art, and Pytor became a pupil. Meanwhile Anatoly had been completing his education. In 1908 when the family had moved from Finland Anatole had been 18 years old. A possible reason to return was to prepare him for university. On the 29th May 1911 Anatoly took an exam to qualify for university. The exam was required because Anatole had moved between three countries while growing up, France, England and Finland, and so could not prove his educational standard. He entered the historical-philological department of St Petersburg University and graduated in 1915. During this time the family were living on Zdanovskaya Street, then later on Vasilevsky Island in St Peterburg or Leningrad. 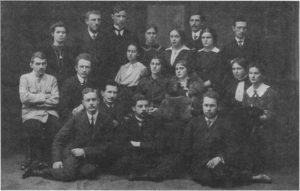 Figure 10 The members of the Hermitage Circle in 1913 Anatole Serebriakoff is in the middle of the front row sitting on the floor. 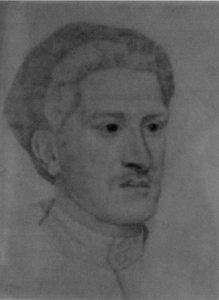 While at university he joined a group called the Hermitage Circle. This was a group of students and tutors who would meet in each other’s houses and discuss politics, literature, and history. The circle was intended to provide guides to conduct tours of the cultural works for workers. In the end however the War stopped this development. 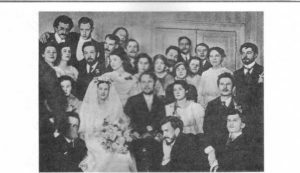 Figure 11 In this wedding photograph the man in the centre of the picture is TN Antsiferova. The wedding was on February 5, 1914. He is the man who was to the right of Anatole in the first picture. These two photographs show the members of the Hermitage Circle and the second photograph is of the wedding of two of the members of the group. In the second photograph Anatoly can be seen standing next to the woman who would become his wife some years later in the early 1920s. The groom, T N Antsiferov was a class mate of Anatole. A friend of Anatoly, M M Lewis, recorded in his memoirs a note about Anatole, “I will mention our childhood friend Tolya Serebryakov, sweet and handsome, capable and extremely good, ever busy with a thousand things, always worried, badly pronouncing the Russian “p” (because of his English upbringing) and therefore slightly skewed and lisped. Tanya and I called him “an angel in student’s uniform”. After graduating Anatole stayed on at the Department of General History and taught history in a commercial school. The commercial school was a new system of education that had been set up. In July 1918 he was sent to Arkhangelsk and Vologda province to undertake an inspection of the ancient churches of the North in connection with a request from the Archaeological Commission. For a time he was a junior keeper at the Art Museum in Vologda. In the spring of 1920 he got into trouble with the local Cheka or secret police. It seems that he went into a church and was seen by someone from the Cheka. He was kept in a forced labour camp for about two years. While he was not kept in the camp under the strictest of conditions, his freedom was curtailed. Ekaterine wrote about this in her diary on 15th April 1922, saying that it had happened two years previously. In 1923 things seem to be running fairly smoothly, Ekaterine is in a relationship with Filonov, working as a translator and English teacher, Anatoly is safe in Finland, Peter is at home with his mother studying under Filonov. In Russia the civil war which started after the 1917 revolution ended in the western part of Russia by June. So the outlook would have seemed good.